Going for a walk can bring pleasure to your day. The basic action of walking can be pleasurable in itself. Walking is also good exercise and beneficial to your health. There are many things that can be part of your walk that can bring an extra dose of pleasure. I enjoy going for a walk on my own, with a companion or with my dog. Some years ago I belonged to a walking group. I didn't know any of the others when I joined the group but I soon had several new friends. On occasions I have a human companion and my dog with me when I go for a walk. I usually take my dog out for a walk after tea. Sometimes I think I am too tired but Coco usually persuades me to go anyway. The surprising thing is I often feel energised when I return from our walk. The exercise involved in a walk is good for me. Breathing in fresh air is healthy and seeing different things stimulates my imagination and creativity. If I have been working on a piece of writing I often get new ideas once I get away from my computer. Walking helps me sort out problems that may be worrying me. Sometimes I get into a conversation with a person watering their garden or with someone else walking a dog. I enjoy the social contact and the conversation gives me something else to think about. I like to go to different suburbs and explore.This is best done on foot. I enjoy taking photos as I walk around.One day I got off the train at North Adelaide and went to a cafe I had read about. Afterwards I went for a walk and took some photos before catching the train home. There was a cycling/walking track with parklands on one side. I appreciate these tracks which are quite common nowadays. They encourage people to walk or cycle in safety away from traffic. I enjoy walking around suburban areas with my camera. There are many interesting things to take photos off which could be useful as images for internet articles. It's always great to come across some street art or a building which is an example of architecture of yesteryear. I also like to walk in country areas. The Barossa Valley is a few kilometres away from my home. In autumn the leaves on the vines are breathtaking and walking here is very pleasant. There are cycling/walking paths in the Barossa too. 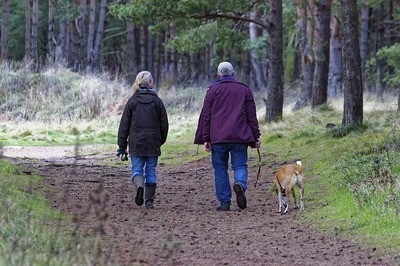 Walking in a natural environment is especially beneficial. It helps to ward off depression and causes a release of 'feel good' hormones. I particularly enjoy walking when I spot different types of birds. I usually enjoy going for a walk. However, there are times when I don't. If my shoes are uncomfortable I don't enjoy walking. I almost always wear a comfortable pair of sneakers so this is rarely a problem. I try to avoid walking in the heat. On hot days I will walk early in the day or near sunset if possible. If I can't avoid being out during the hottest part of the day, I try to walk in any shade available. I wear a hat and carry a bottle of water with me. I prefer not to get soaked on a cold rainy day. If I have to walk while it is raining I will carry an umbrella and wear a water proof jacket. Walking brings me pleasure and is good for my health. That is a great combination.